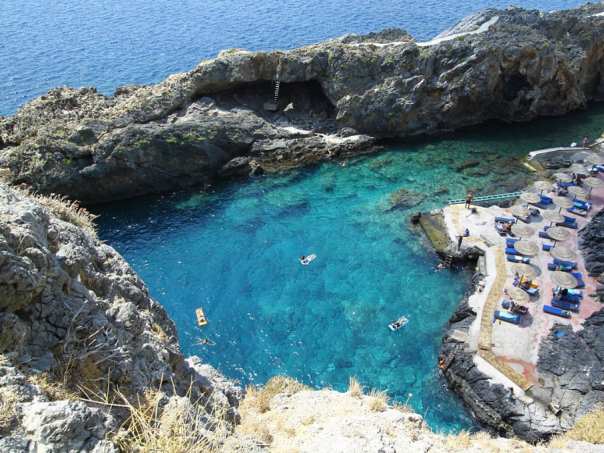 The small but stunning beach of Pirate’s Fjord is located 36km south of Rethymno town and about 5km west of Plakias. Showers, umbrellas and sunbeds, water sports, parking, cafe, snack, restaurant, All Inclusive Hotel, diving center. Pirate’s fjord beach is a very narrow oblong cove, surrounded by towering rocks and served as a pirate shelter during the Byzantine era. The tiny beach which is shaped has sand at its starting point and doesn’t exceed 2m in width. It deepens abruptly and changes to a deep rocky harbor, perfect for smorkeling. Pirate’s fjord beach is accessible only by private or rented cars and motorbikes or by boat from Plakias. If you choose to drive from Rethymno, follow the provincial road Melambon-Agias Galinis to the south. After about 18km turn right towards Lefkogia and Kokkina Horafia and follow the signs leading to the Kalypso Cretan Village AI Hotel.